The one month recruitment of more than 1,800 armed forces personnel starts on Tuesday next week. Defence headquarters warned the public to be wary of fraudsters out to lure them with promises of jobs in exchange for cash. Vice Chief of the General Staff Julius Waweru Karangi regretted that Kenyans had lost Sh19.3 million to fraudsters in the pretext that they could get jobs in the armed forces since January last year. In Nyeri, one woman conned 46 individuals Sh10 million while in Mbooni a 76-year old man was sentenced for 25 years for the offence. In total, there were 63 cases, 21 of them involving servicemen and ex-servicemen and the rest civilians. “We warn the public that there’s danger out there. The cases only tarnish our image and the whole exercise. Let the public know they are not supposed to pay anything to serve their own country. "It is free and voluntary. We appeal to the public not to get into the trap of these bad elements in the society,” Lt Gen Karangi said. He said the last suspect masquerading to recruit military personnel was arrested outside the DOD gate on Monday adding that the Kenya Anti-Corruption Commission had also been asked to monitor the exercise. A presentation during the press briefing showed that Sh3.9 million was given to serving personnel to enable some individuals join the army while Sh15.3 million exchanged hands between other fraudsters and victims. The army dealt with 18 cases involving its members, which culminated in dismissals or fines. However, of the 42 cases involving civilians only three were prosecuted. Addressing journalists at Defence headquarters in Nairobi, Lt Gen Karangi said more than 1,800 youth are to be recruited to join the armed forces from Tuesday to October 22. Last year, Lt Gen Karangi, who was accompanied by Defence spokesman Bogita Ongeri, said 5,000 people were recruited to join the military. The exercise is to meant to replace soldiers who have retired, died or address existing gaps and Lt Gen Karangi said it also depends on Treasury allocations and training capacity. He said the recruitment would also seek to address government’s policy that 30 percent of public service recruitment should be women. Stressing that the military key values are civil prerogative and professionalism, Lt Gen Karangi said politicians would also not be allowed to interfere with the listing. The vice CGS said the recruitment will cover all the districts and that the military will strive to ensure all the communities were included. 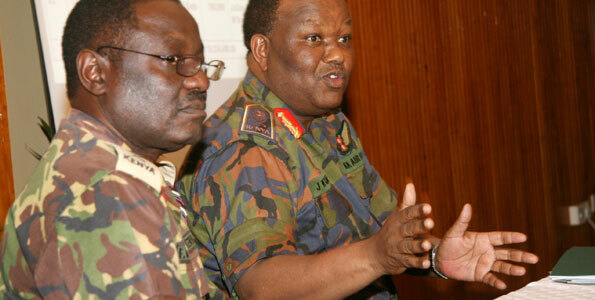 “We will recruit eligible Kenyans from all the communities,” the vice CGS said. The recruitment will be done in Kieni East, Nyahururu, Embu East, Chapalungu, Nandi East, Samburu North, Londiani, Trans Mara East and Kisumu East on Tuesday. The exercise will also be held in Bunyala, Pokot Central, Msambweni, Tana Delta, Limuru and Mbooni West on Tuesday. Loyangalani will be the last to conduct the recruitment on October 22. The Kenya Army, Kenya Air Force, Kenya Navy and the Armed Forces Constabulary recruiting teams will visit the districts to recruit servicemen, servicewomen and armed forces constabularies. i am in Gatunndu when will be the exercise in our district. Im from turkana when will be recruitment take over?. am from lower yatta kitui when will be recruitment in our district?